Updates from prior episodes: Groundhog #1 (“Thomasson”), Groundhog #2 (“Wide Load”), and Groundhog #3 (“Baby”) are now living fulfilling lives in the county park, along with Opossum #1 (“Dignified Opossum”) and Opossum #2 (“Young Opossum Doesn’t Like It”). 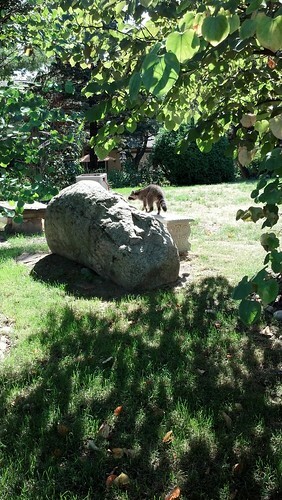 Mr. Nonchalant Raccoon, trapped twice and featured in my last post, continues his carefree life. Here he has shown himself during the day standing on my neighbor’s decorative bench to indicate that he is not afraid of us in any way. Chickaree has not been seen lately. Perhaps he will return in a future episode. Episode 36. 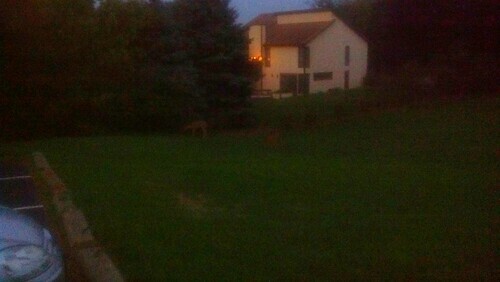 At twilight, two deer stop by to eat our bushes. Here is a dim picture of one of them. Episode 36-a. Does this seem like a lot of wildlife to you? A colleague who has been reading this blog (you know who you are) said that they thought we lived out in the country. Let me state for the record that we live in the center of town. We are on Washtenaw Avenue, certainly one of the busiest streets in Ann Arbor. It is a 20 minute walk to the campus (medical center side). The problem is not that we are out in the country, the problem is that our house is infested with groundhogs. Episode 37. We are re-doing our roof and the Critter Control guy advises me of the delightful news that squirrels have probably been nesting in our old roof vents. I have a discussion with the roofer about roofing materials that hinges on whether different roofing materials are easily eaten or not. Episode 37-a. What a strange conversation that was. I never thought I would have this kind of conversation with anyone. Episode 38. After we return from a week away we bait the traps with fresh apples and re-set them. Within just a few hours, there’s a ruckus at trap #1. 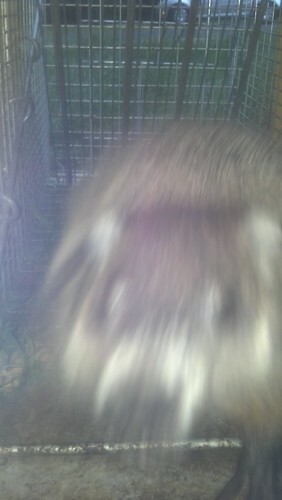 It turns out to be our new friend, Aggro Groundhog. Episode 39. In case you’ve lost count, this makes Groundhog #4. How many can there possibly be? This is ridiculous. I have decided to open an office pool. $1 per entry. The bet shall be: How many groundhogs in total will we capture in this 30-day period? (That’s the term of the Critter Control contract.) No house take or vig! Let me know if you want in. This entry was posted on Wednesday, September 19th, 2012 at 1:56 pm	and is filed under Groundhogs, Living. I am betting that there will be a total of 6 groundhogs caught. 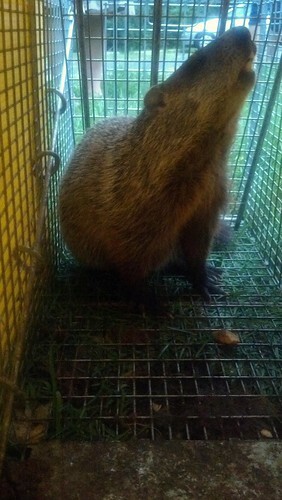 I want to also make it clear that Aggro Groundhog was the result of our daughter’s trap checking. Only one person in our family has a long enough arm to actually pull the traps from their spot, but she’s very proud that she was the first one to catch it and I wanted her to get the credit. It used to be that “checking the traps” was a boring and quotidian chore but now everyone does it all the time because of the rewards. I’m not a betting man, so I’ll pass on the office pool. But I’d like to suggest a blog category for Wildlife in the City to make it easy to go from earlier to later parts of the saga.